People have been drawn to LASIK eye surgery for years. There are tons of benefits that come from no longer needing to wear glasses or contacts, but many people opt out of LASIK because they’re afraid of the procedure, or are worried about the risks. Many others think they’re not ideal candidates, based on things that friends or family members who have received LASIK say. Bayside Eye Center in Punta Gorda is here to give you all the details about LASIK. 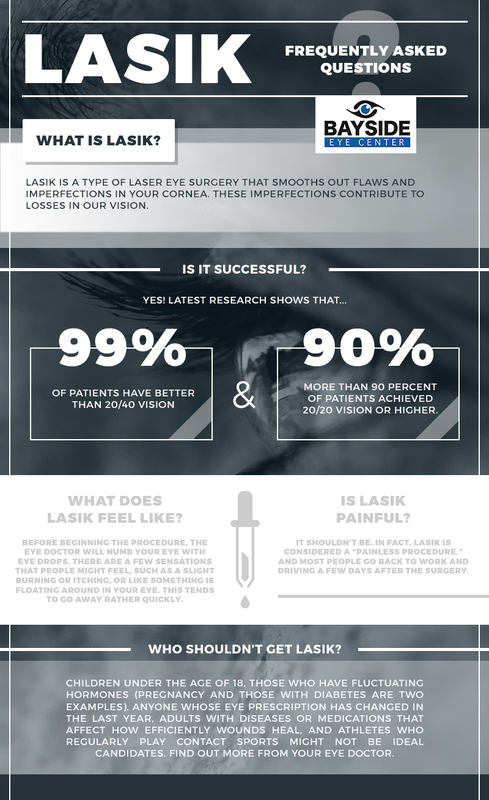 Find out more, and contact our eye clinic to see if LASIK is right for you. LASIK stands for Laser-Assisted Stomal In-Situ Keratomileusis, a very long and medically jargoned acronym that stands for laser eye surgery. Certified and trained eye surgeons perform this procedure for qualified candidates who wish to no longer wear glasses or contacts. Why Do People Get LASIK? Anyone who wears glasses or contacts knows that either of these corrective lenses can be cumbersome. For those who wear glasses, it can be physically uncomfortable, or even a hassle, to have glasses resting on your face at all times. It’s a major inconvenience when trying to swim, play contact sports, or do many other types of activities. 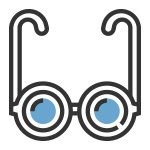 Plus, losing or breaking them puts the wearer out of great vision for at least a few days (or even weeks) until a replacement pair can be made. Not to mention, they’re expensive to replace — usually a couple hundred dollars if you’re going for a pair you really want to love. Similarly, contacts-wearers can relate to some of the nuisances that come from these types of corrective lenses. Dry eyes, sticky or fading contact lenses, the pain from getting something in a lens — all of these are some pretty significant downsides to wearing contacts. Not to mention, they’re expensive, and buying solution and products to reduce dry eyes continue to rack up costs. Does it hurt to get LASIK? An eye surgeon will numb the eyeball before beginning LASIK, making this procedure painless. There might be some discomfort, but it’s very rarely something serious or severe — people report itchy eyes or feeling like they have something stuck in their eye, but that’s about it. After the procedure, another side effect is having watery eyes, but all of these experiences and side effects are minor, and go away pretty quickly. You’ll likely meet with your eye doctor between 1-2 days after getting LASIK, to ensure that your eyes are healthy and healing. After a few days, you’ll be able to start up non-contact sports, such as running or biking, and you’ll likely feel back on track around this time. When will I start having better vision? The FDA reports that you might experience some changes and fluctuations in your vision for the first few months after LASIK. As they state, “It may take up to three to six months for your vision to stabilize after surgery.” You might experience some problems with glare and seeing halos for a little while, but these symptoms should fade within a few months. Your eye doctor will give you all the information you need, as well as the number of checkups they recommend post-surgery to ensure your LASIK procedure is continuing to heal as expected. After your LASIK procedure, there are a number of things to keep in mind as you begin to recover. As an important note, this timeline is a guide, and not a guarantee for your recovery time — your eye doctor might have other instructions, and it’s recommended that you follow your doctor’s order. 1-2 Days After Surgery: You’ll visit with your eye doctor again as a post-LASIK check-in. 1-3 Days: You can begin non-contact sports again, depending on how you feel and your doctor’s recommendations. 1-2 Weeks: You might need to hold off on using lotions or makeup around your eye. 1 Month: Contact sports, such as football or boxing, can start up again. You’ll also need to wear an eye shield when you sleep at night to prevent any accidental eye rubbing. 2-3 Months: You can use a whirlpool, hot tub, and/or start up swimming again — water, particularly chlorine, can be abrasive on your eyes, particularly after getting eye surgery, and it’s best to avoid swimming and such until you’re fully healed. 6 Months: You’ll continue seeing your eye doctor at regularly scheduled appointments for the first six months to see that your vision and the results of the procedure are continuing to progress. I’m interested in getting LASIK — what now? Our Punta Gorda eye doctors would love to consult with you to see if LASIK is a procedure you could benefit from. As experienced and trained eye surgeons and optometrists, we administer detailed testing to ensure you’re a qualified candidate for LASIK — and if you’re not, you will be the first to know. This is a procedure that works wonderfully for many, but not for all, and Bayside Eye Center offers so many other eye clinic services to help your vision be at its very best. Schedule a LASIK consultation today!